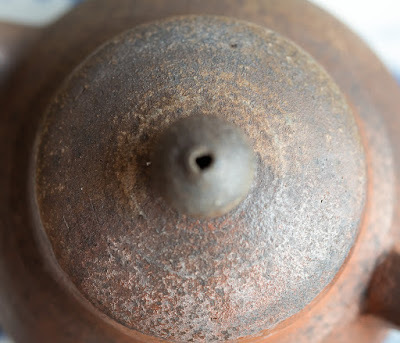 Many tea fans consider puerh a very rough tea that benefits a lot from being brewed in an unglazed clay teapot. 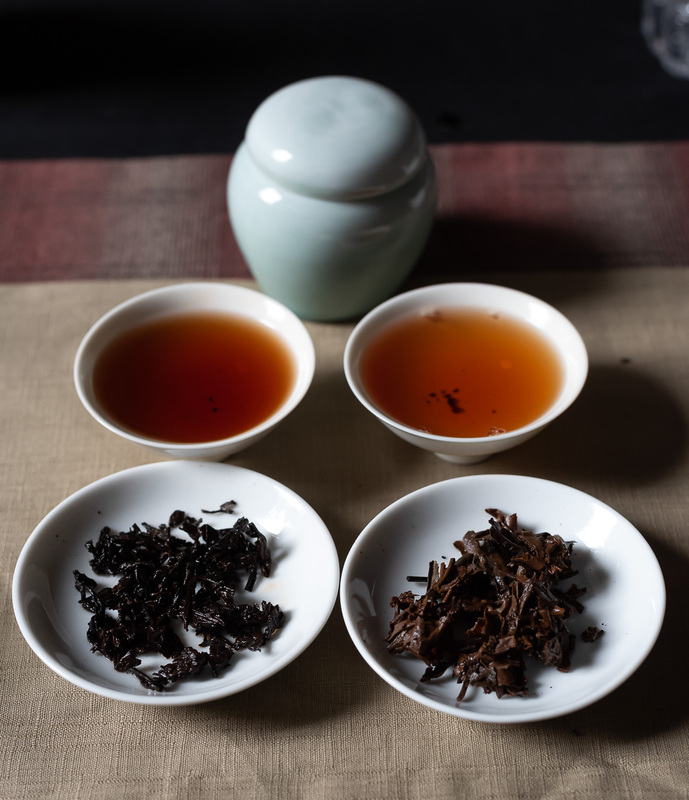 With most puerhs this is certainly true, but puerh can also be one of the finest and most delicious tea if you select top quality leaves. And I proved it today with this class of 6 puerh we brewed in plain white porcelain competition sets! (Porcelain is neutral for the taste. It's used by professional tasters. 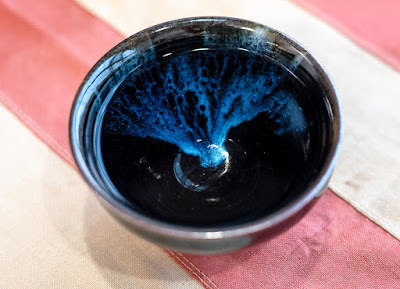 It lets you see the color of the brew well.) In terms of methodology, I didn't use the Oolong standard of 3 grams and 6 minutes of brewing time. 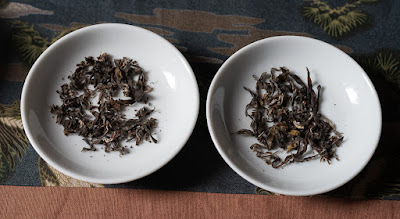 Since gushu puerh is made very powerful leaves, we used few leaves (see the plates). The brewing time was long, several minutes, but not measured with a stopwatch in order to keep things relaxed. 2. the spring 2017 cake. 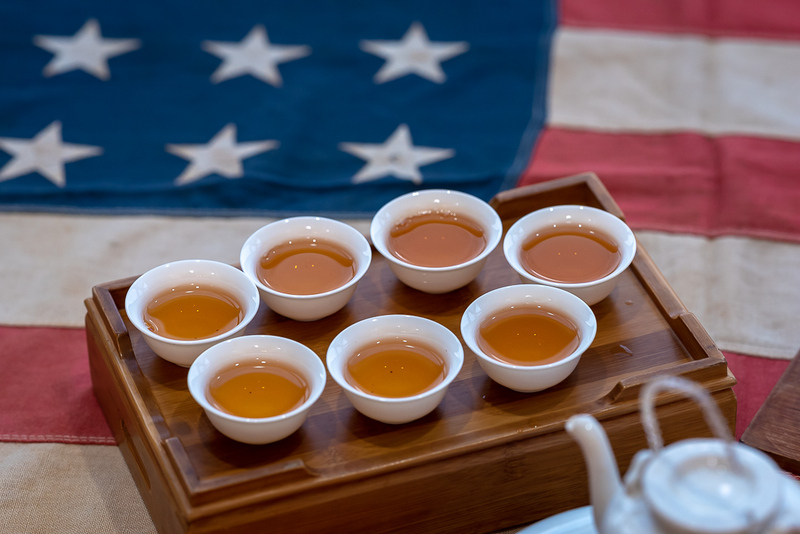 It was interesting to feel the energy of these teas and how the 2017 already feels much more tamed and mellow than the 2018. My student also found these teas amazing by the little quantity of leaves we used and the powerful brew they made. 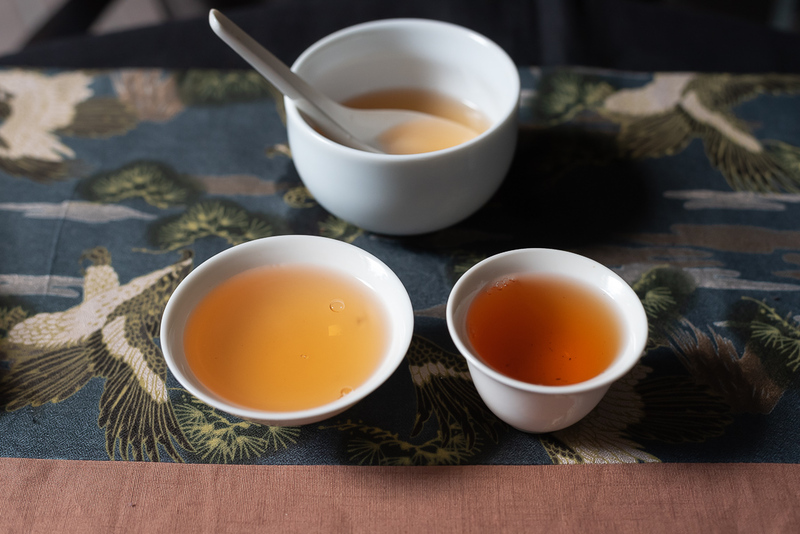 We used 2 ivory porcelain cups: the large ivory singing cup makes the brew look lighter than the flower shaped cup! 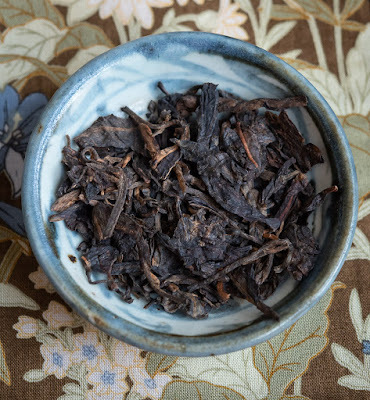 4. the spring 2003 raw wild Yiwu puerh. 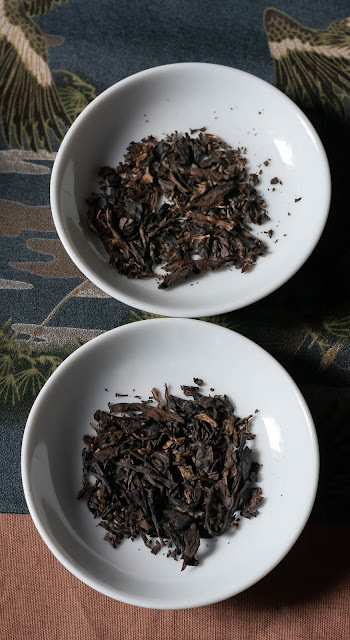 The 2003 wild Yiwu is the tea that started my puerh education 15 years ago! It's nice to see and taste the evolution. There was an awkward time when the tea was 6 to 13 years old, not young, but not aged yet. Right now it's really gaining these aged wood and raw clay (?!) earthy aromas, while keeping most of its energy. The brew also looks beautiful in the cups. 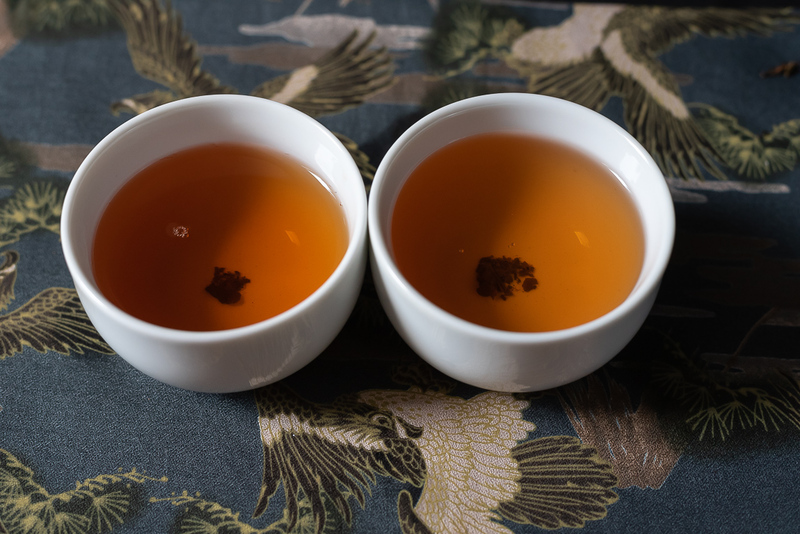 Since these teas come compressed, it's important to flake the leaves well and use strength with the first pour. 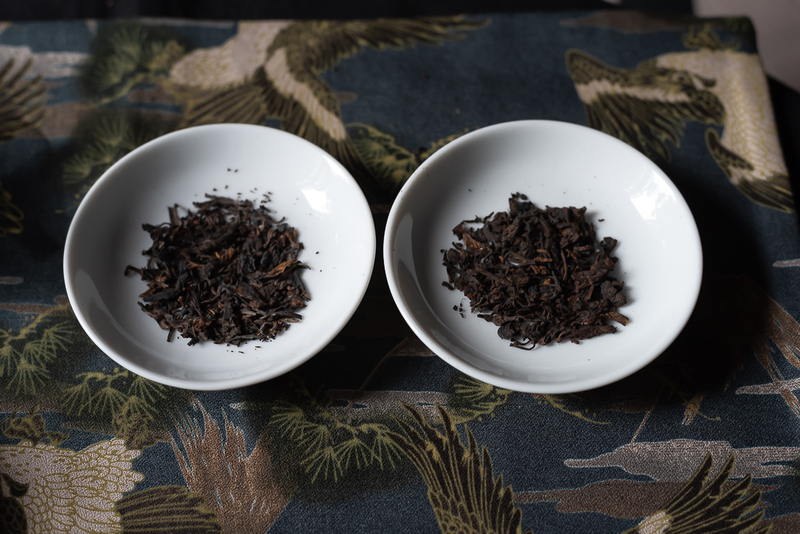 The aromas of these 2 teas are also quite different because they come from 2 different regions in Yunnan. 6. The 2001 Xiaguan cooked melon puerh. (I used a little more leaves than the 7542, because cooked leaves loose a lot of their energy). 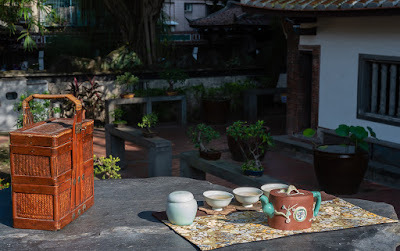 The 1999 spent most of its time in a puerh warehouse in Taiwan. Unlike my home, there's no air conditioning during summer in these warehouses. 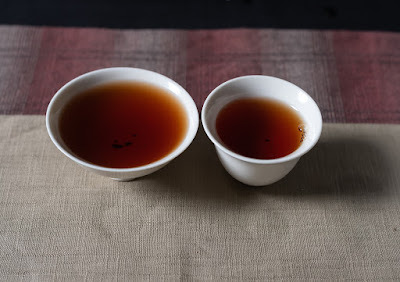 That and 4 more years of age explain why its brew is much darker than my 2003 Yiwu. 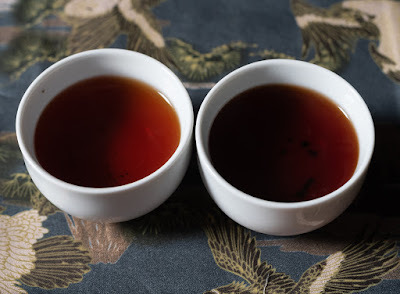 Drinking these 2 puerhs side by side showed the similarities and differences in aged shu and sheng puerh. 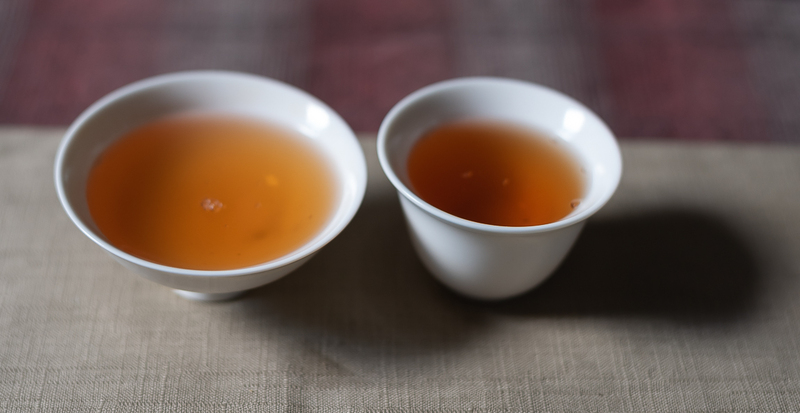 Both taste very tasty, but sheng has more energy and aftertaste. This shu puerh, though, is extremely smooth and soothing. The difference is also in the spent leaves: sheng leaves open up and turn brown, while shu leaves remain shriveled up and very dark. On this cool day of October, these 6 amazing puerhs all felt very welcome and in harmony with the season. 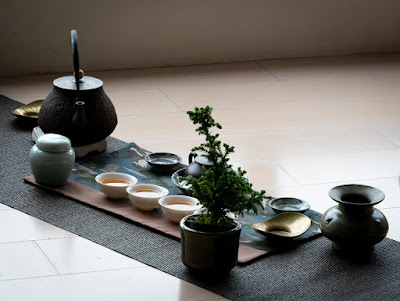 This class was a good reminder that if you want to learn tea well, it all starts with good leaves. We call it "tea with benefits"! 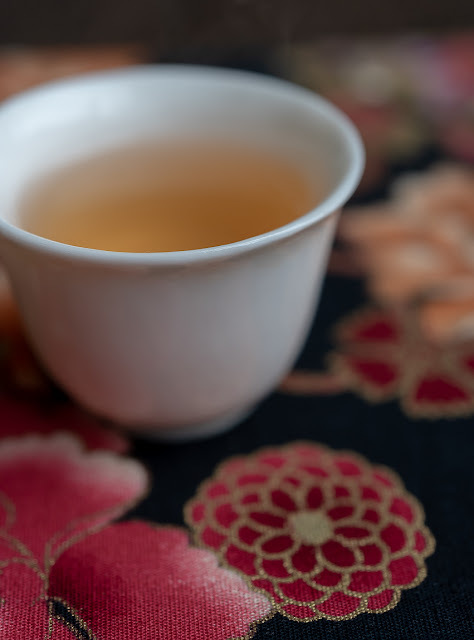 It's not just having tea, but enjoying a moment of peace, comfort after, during or before a rough day. Read the headline news about the world and you quickly long for something to relax and feel sane again. 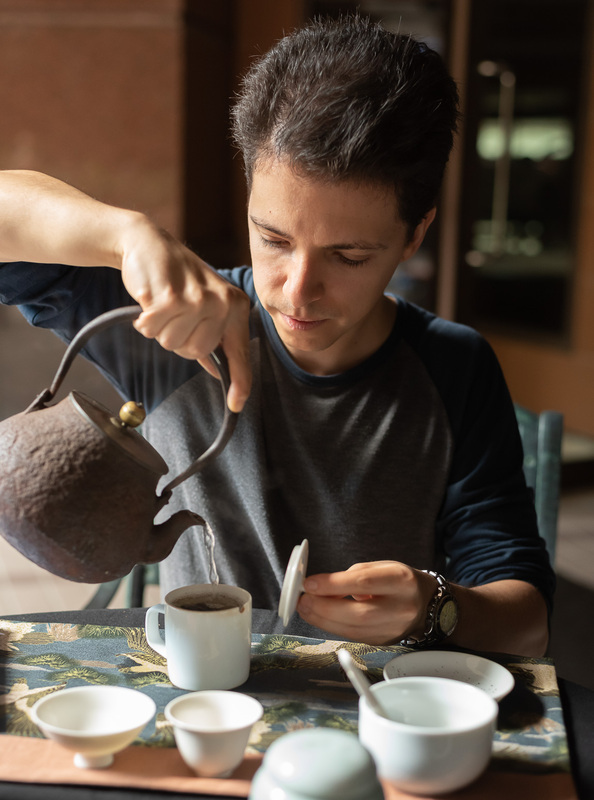 And in a world of food chains and micro-waved industrial dishes, tea is a way to claim back a sense of refinement and good taste. And maybe even health! 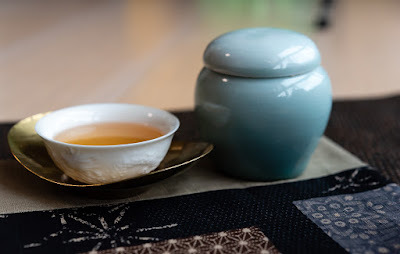 I find these added benefits very real when the tea is really so natural and good that it tastes amazing and gives much more pleasure than normal food. While I know how much enjoy the teas I've selected, I also appreciate to receive feedback from my customers. I'm very thankful for Andrew's message from the UK. 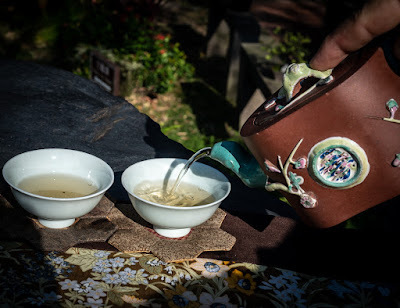 He wrote: "A few friends have asked me to make some tea samples for them so they can try quality teas. 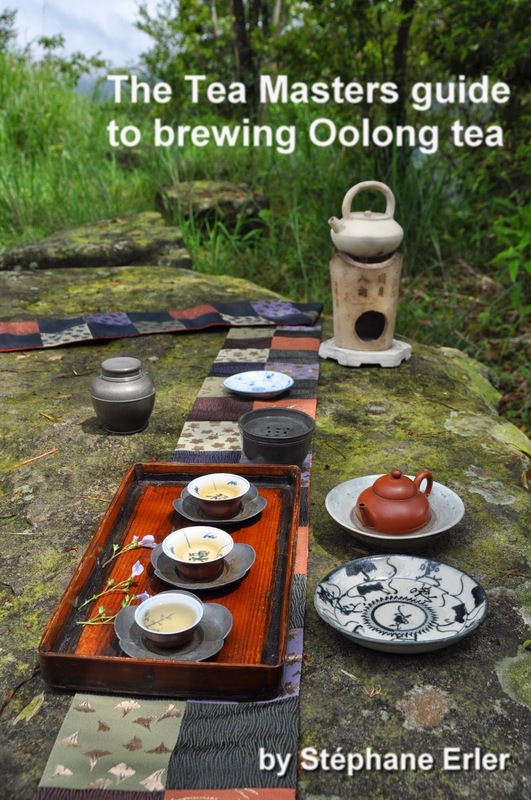 I plan to share some of your quality oolongs with them and hope they can learn to appreciate quality tea like we do. 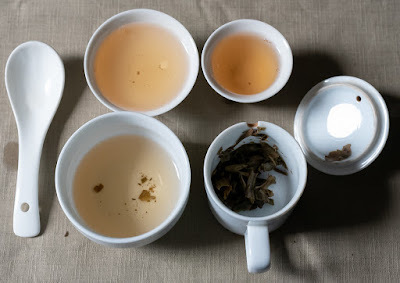 I have been sampling around quite a few oolongs this season from various sources, but honestly what I have tried, none compare to the oolongs you are offering. Thank you for doing what you are doing." Let's train our observation skills on 2 puerhs from my selection I've brewed recently. Can you recognize which one is the oldest? Are they sheng or shu? Can you maybe even recognize which ones they are? 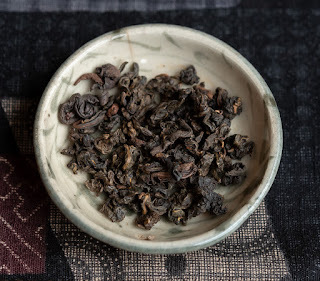 This kind of exercise is interesting, because it teaches you to find answers about a puerh you might want to buy from the leaves themselves instead from the wrapper or the story told by the vendor. Learn to read the tea leaves! (The answer to this quiz is at the end of the article). The second subject of my article is paradigm shifts in tea. To explain what's a paradigm shift, I like the picture on the left: it shows a young lady or a very old one depending on how your brain processes the image. 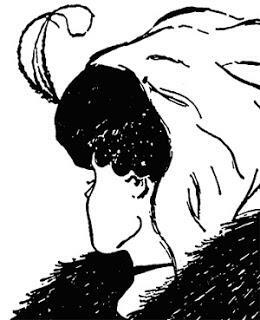 The shift occurs when you start to see the second person instead of seeing the first. It's kind of destabilizing, because it challenges your beliefs and perceptions of reality. 1. 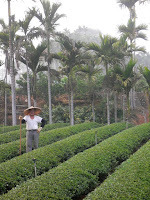 Before: Straight and parallel lines of tea bushes, like in the picture on the left, look beautiful. Now: Such plantations are shaped to be machine harvested. 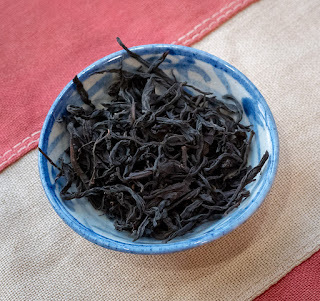 They mass produce tea that is mostly of lower quality. Tea trees that grow differently, with more space are naturally beautiful. 2. Before: Teas from Mainland China are cheap, low quality and suspicious, while teas from Taiwan are expensive, high quality and healthy. 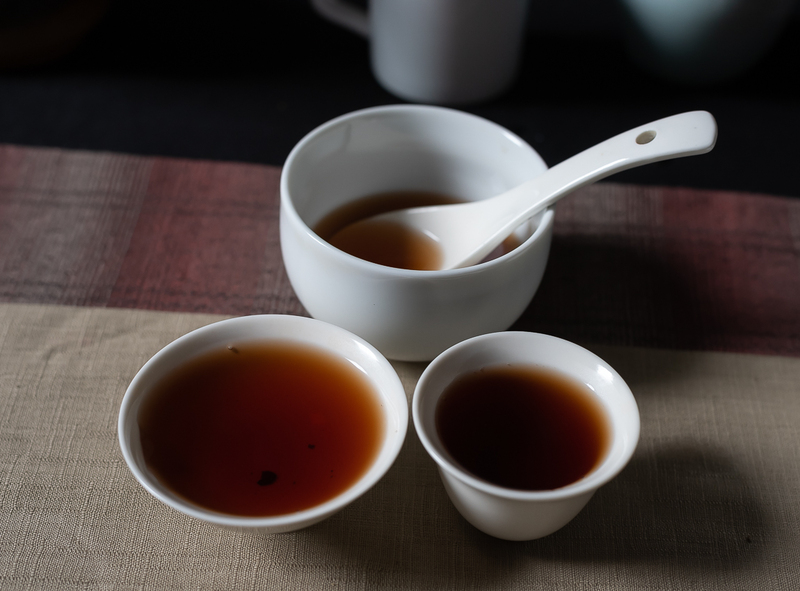 Now: Teas from Mainland China vary a lot. 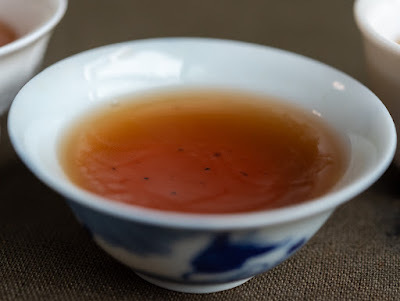 The best Chinese teas (gushu puerh, Yan Cha...) are much more expensive than top Taiwanese teas. 3. Before: Taiwanese tea farmers go to China to lower their production costs. Now: Taiwanese farmers go to China to sell their teas to affluent customers. 4. Before: Big wooden tea tables are cool. 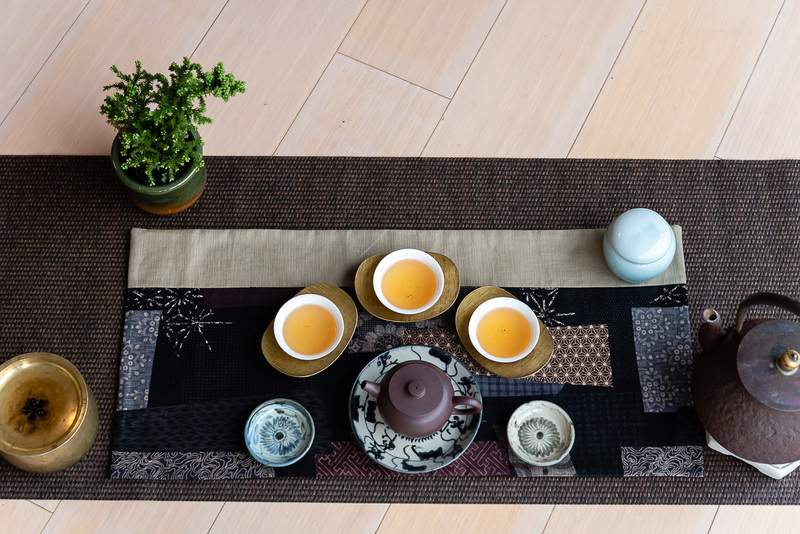 Now: Big wooden tea tables are ugly. 5. Before: I trust labels on tea packaging. 6. 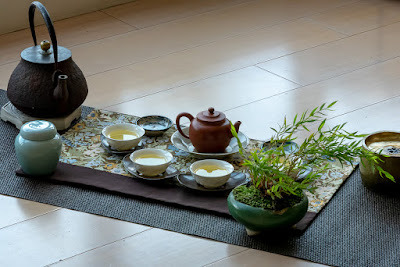 Before: I'm taking a few classes with Teaparker and will soon learn everything there is to know about tea. Now (15 years later): I'm still going to the weekly class. The learning never stops. 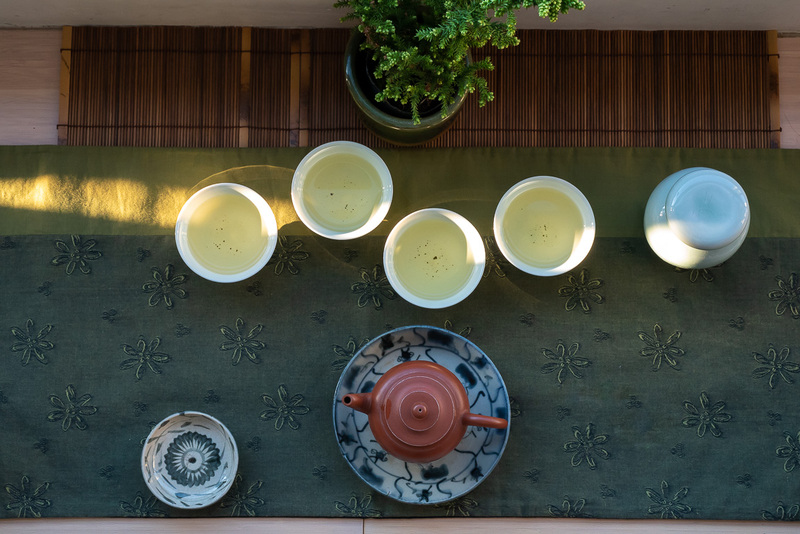 The world of tea is boundless. - Puerh A is the 2003 wild raw puerh from Yiwu. 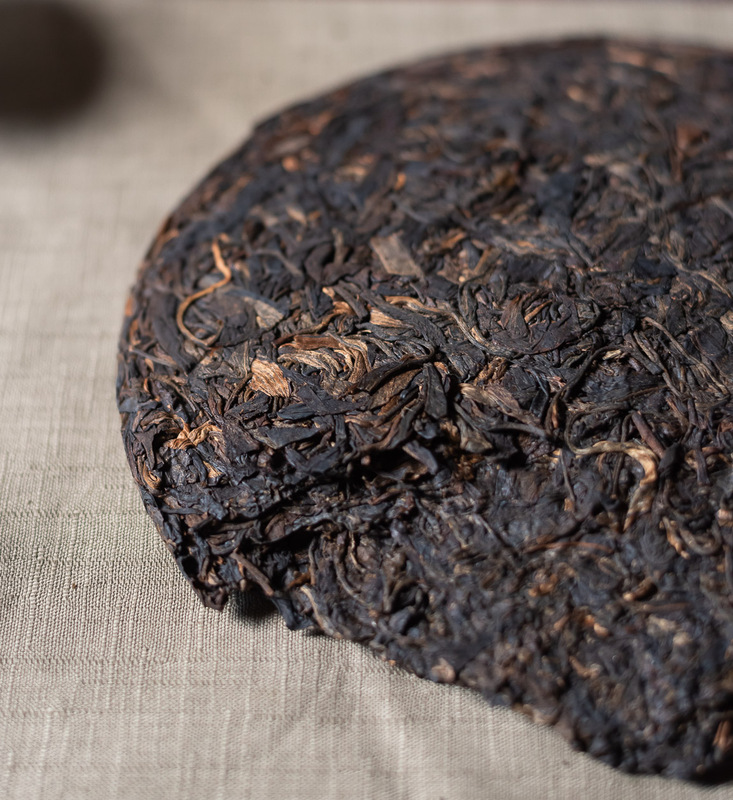 - Puerh B is older, because it's the early 1990s Luyin raw puerh cake from the Menghai Tea Factory. 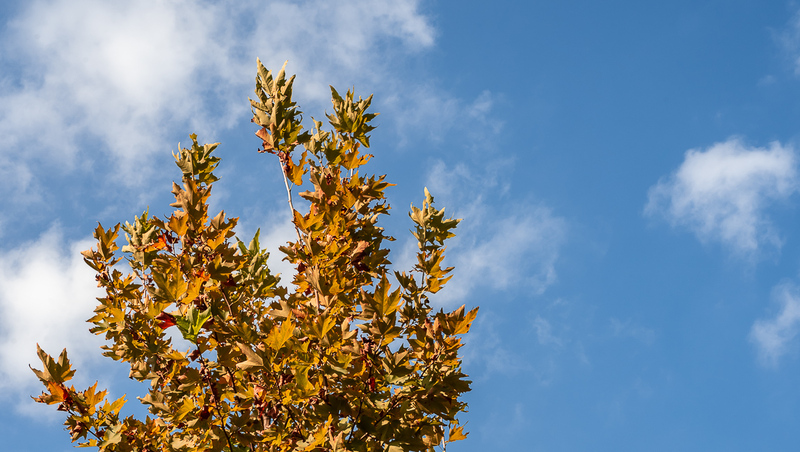 Please also check my latest Fall 2018 specials. 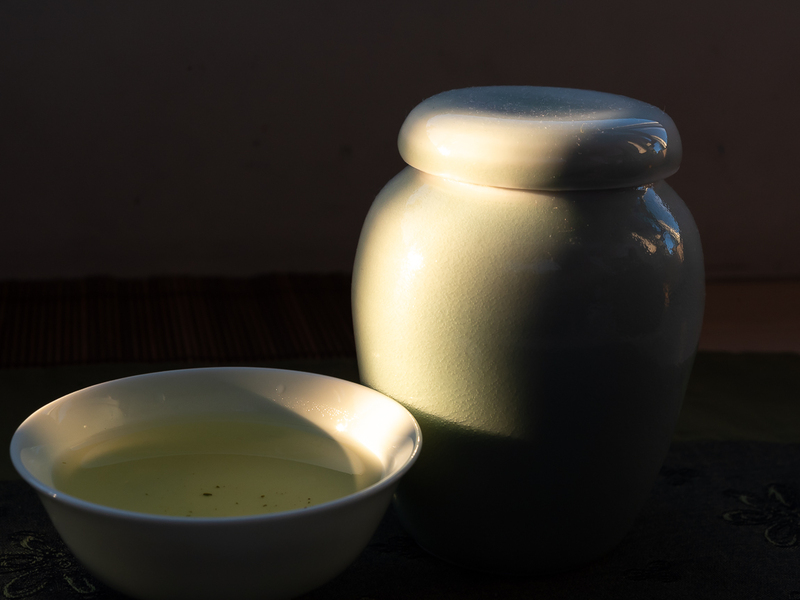 The tea jar is the most overlooked tea ware in our modern times. 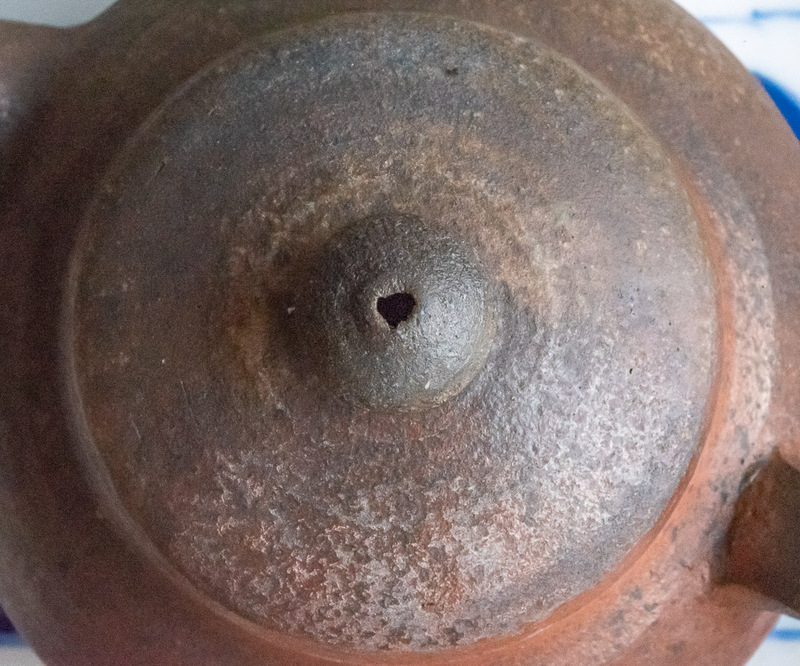 Teapots, cups and (most) kettles have not been replaced with plastic and we, rightly, pay attention to the quality of the material they are made of. For storage containers, plastic foils are dominating the field because they are very cheap, light to transport and can be easily vacuum closed. They provide a very cost efficient protection against air and outside scents. (Not all are fully opaque, though. But the foils I use for my samples do also provide a protection against light). 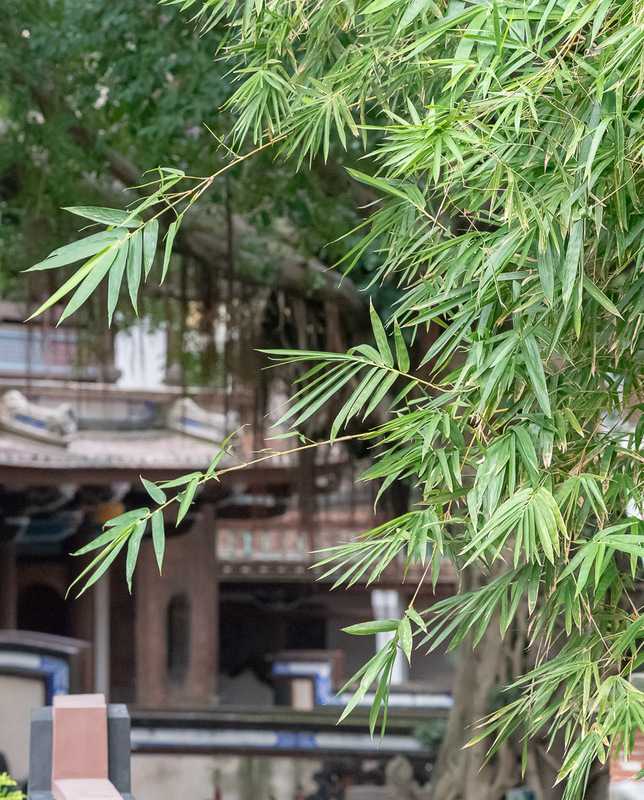 Their drawback is that plastic isn't as natural a material as porcelain. 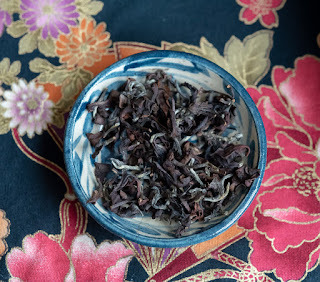 My tests in 2010 have shown that porcelain jars better preserve and refine roasted Oolong leaves than plastic foils. But all porcelain jars are not created equal! This test in 2011 showed that industrial porcelain didn't preserve the leaves much better than plastic foils! 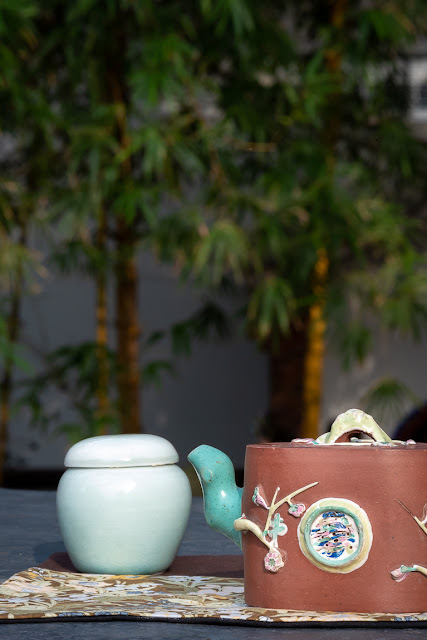 That's why I have tried to find ancient porcelain jars or have cooperated with modern ceramists (Petr Novak, David Louveau) to create jars made from high quality and natural porcelain. 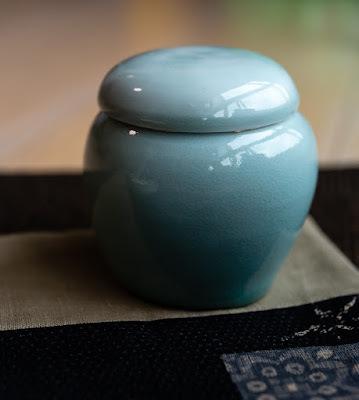 And now, for the second time, Michel François has created some celadon tea jars for us. (See the first time here). 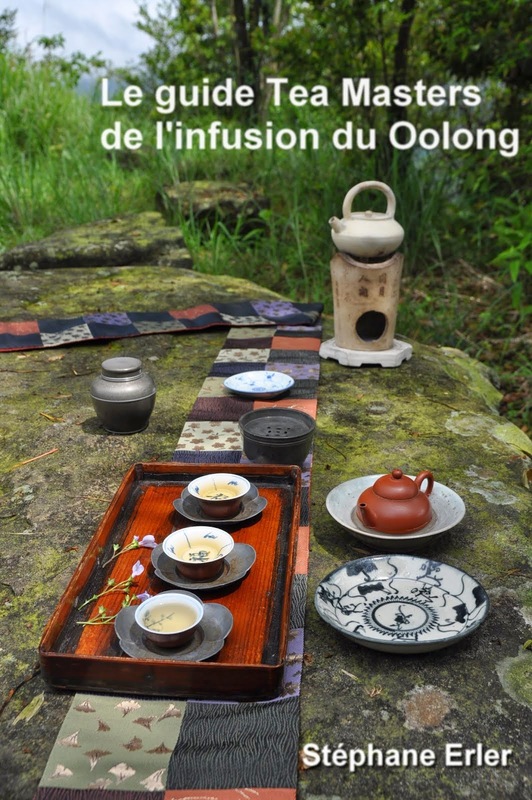 The jars find all their 'raison d'être' on a Chaxi! Their round shape protects the leaves in a very feminine way. The jar contains the leaves, which are like seeds of our pleasures to come! 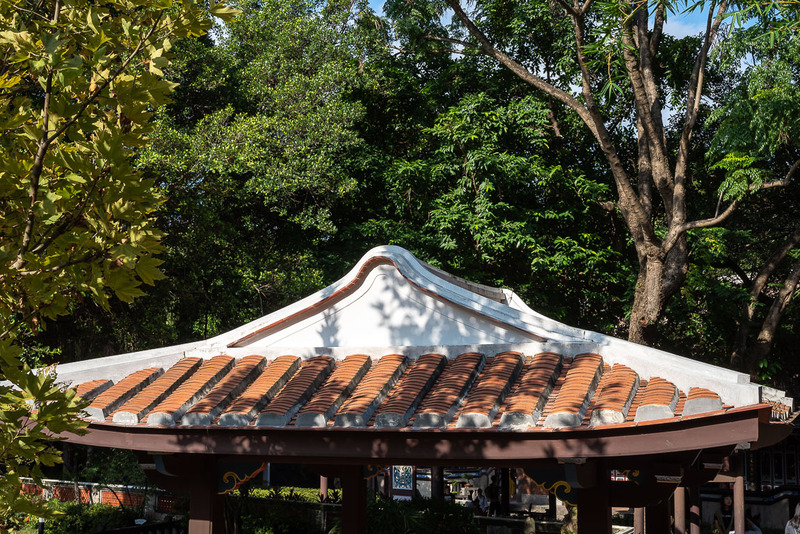 It's not just a bright protection against air, moisture, light and heat (porcelain is cool), but it's also a place where the leaves can slowly evolve in a natural environment. It's clean from all those micro particles that plastic slowly releases as it decomposes. 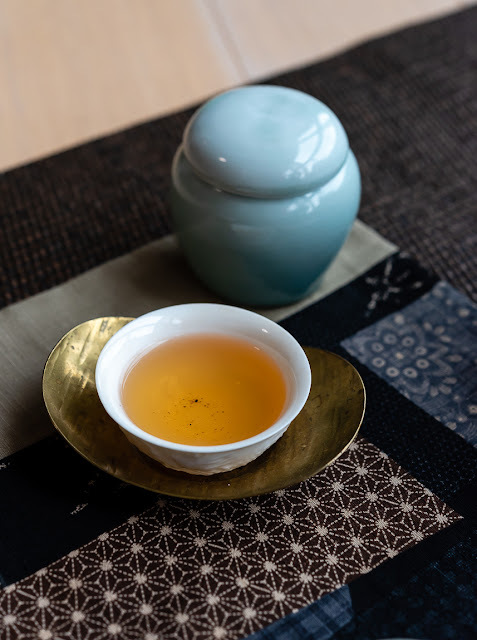 That's one reason why there's this 'decanter effect' with Oolong placed in a jar even for a little while: it breathes freely and becomes smoother. For this effect, Michel François is using the best kaolin from New Zealand and volcanic feldspar from England. His glaze contains some animal bone ash that adds a special pearl like glow. And finally, this tea jar adds beauty and elegance to the Chaxi. Since it's hand made, each jar has its own personality. But with this plain glaze, I like the restraint it shows. This makes it easier to fit the jar on a variety of Chaxi. 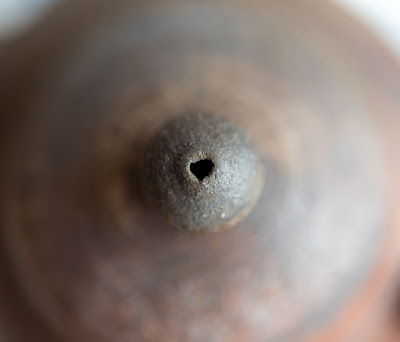 (Wood fired ware often displays too much personality and can be more difficult to pair). 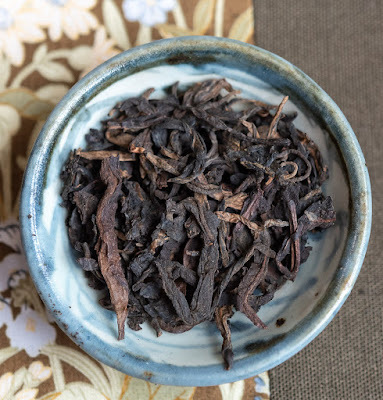 I have tested this jar with various Oolongs and found that it works very well with Hung Shui Oolongs, jassid bitten Oolongs and even with high mountain Oolong! It reduces and smooths roasted aromas. It sweetens high oxidized Oolongs. 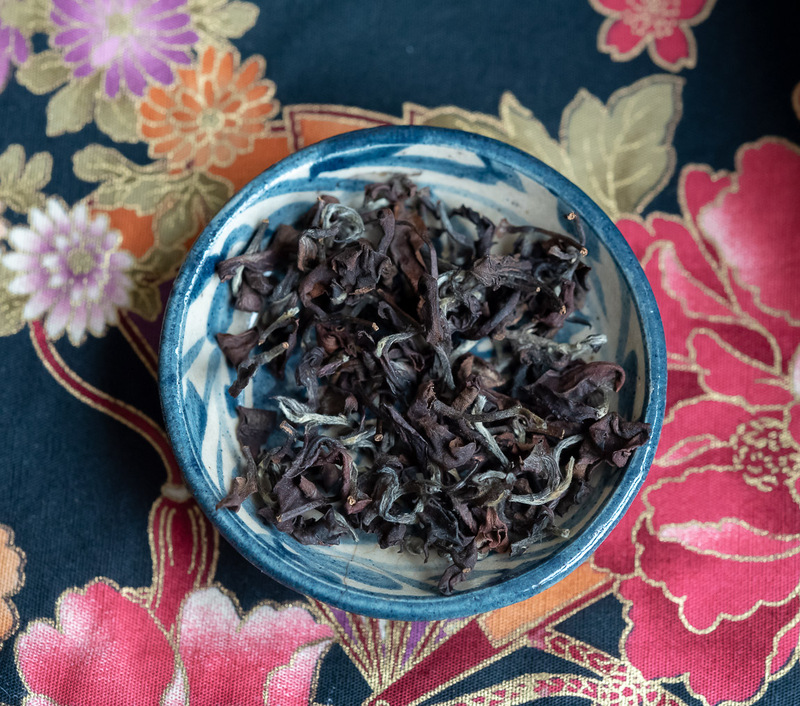 It keeps the freshness of the high mountain even as the tea evolves faster than in a vacuum sealed foil. What has amazed me most is that even very little amounts of tea are well preserved over several weeks/months in these jars. And since the inside is glazed, it's possible to reuse a jar with different teas (provided you've cleaned it and aired it well). Michel François also makes wonderful tea bowls and cups, but jars are his real passion. That's why he named his blog Tea Jar! Michel François is in South Korea right now to continue to learn jar making with a local ceramist. With his talent, there's a risk (for us) and chance (for him) that he'll become so famous that his prices will soar in a few years. 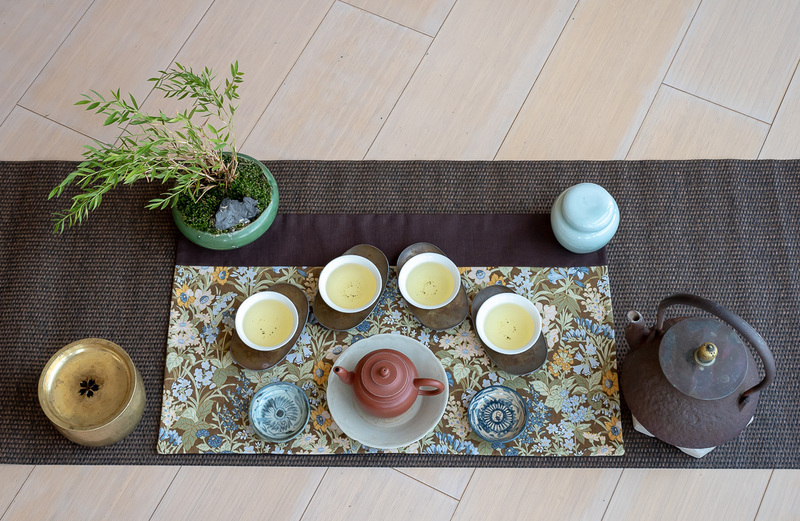 Without a tea jar, no Chaxi is complete! 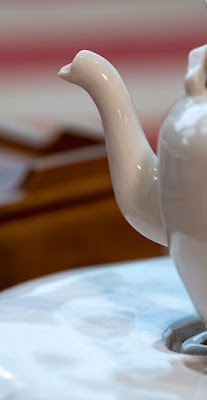 - Page 257: "I told my messmates that I could not carry our kettle any further. (...) Of what use was it? They had nothing to cook." Hunger was another problem that plagued the American forces in their fight against the British. - Page 331: "Tea and coffee replaced more potent beverages." 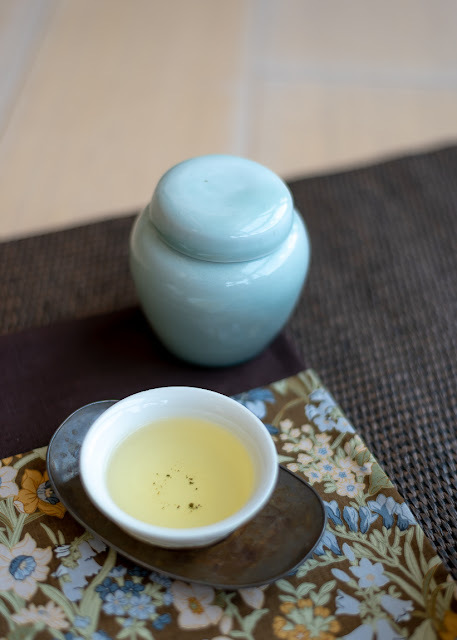 During periods of mourning the death of family members, alcohol wasn't consumed. 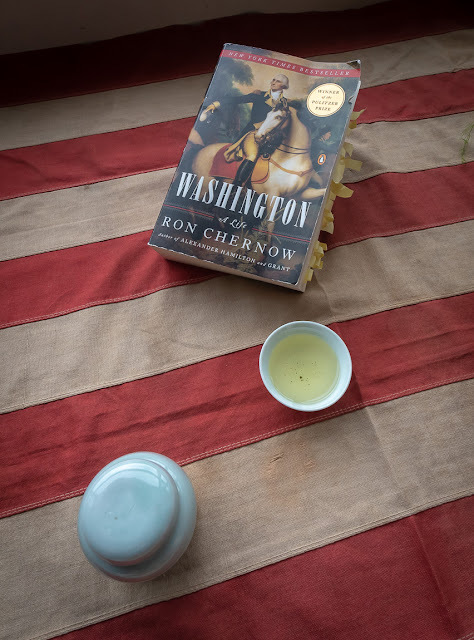 - Page 451: "Suddenly an avid consumer again, he went shopping for teapots, coffee urns, and other silverware for entertaining guests at Mount Vernon." Having won the war, Washington turned to teapots! He's my hero! 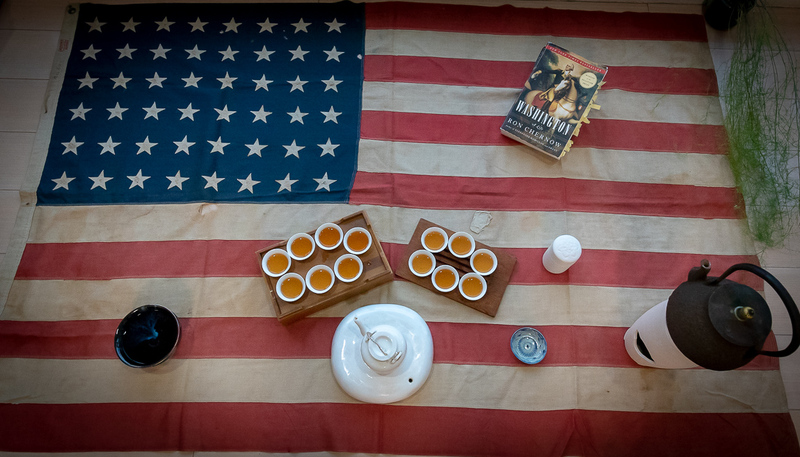 - Page 466: "Washington showed up in the room of a sick guest, proffering a hot cup of tea." The retired general remained a kind and decent host. 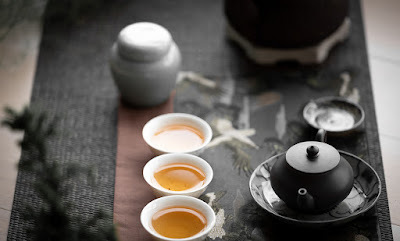 - Page 467: "Drank tea there in a very large circle of ladies. (...) met Powel alone for teas, and corresponded with her." Washington was married, but liked the company of ladies. Did he have more than tea with them? 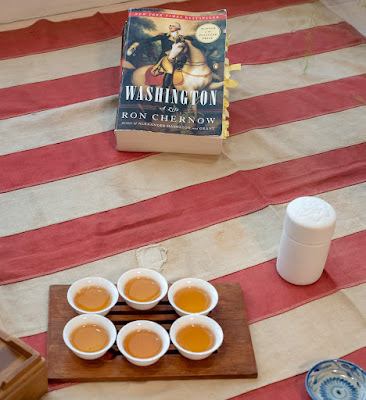 - Page 534: "While the convention dragged on, Washington drank enormous quantities of tea at the City Tavern and the Indian Queen"
In those days one would drink tea and socialize! 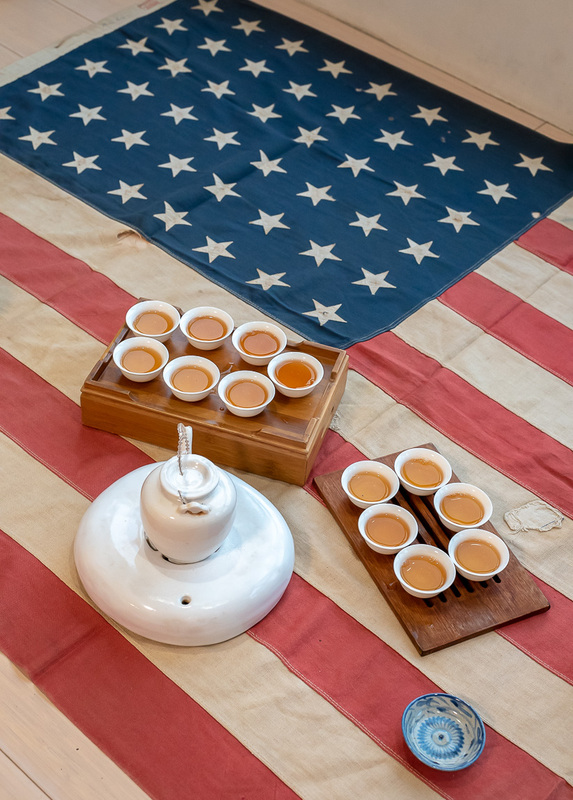 - Page 578: "He and Martha (the first lady) decided that she would entertain female visitors every Friday evening from seven to ten, serving tea, coffee, ice cream and lemonade." This is how guests were entertained by the first president of the United States. - Page 579: "Another observer noted that Washington seemed less austere at his wife's teas." Tea made him feel more relaxed. - Page 583: "Far from shunting off decorating on his wife or subordinates, he trusted his detailed knowledge of the decorative arts. To create a tea service, he melted down some old silver and had the finished products engraved with his griffin crest. (...) Washington oversaw the purchase of many objets d'art, including porcelain figures, silver spoons, and a china set embellished with the eagle of the Society of the Cincinnati." An interest in art and elegance is what makes Washington complete. He knew that what you have shows to others who you are. 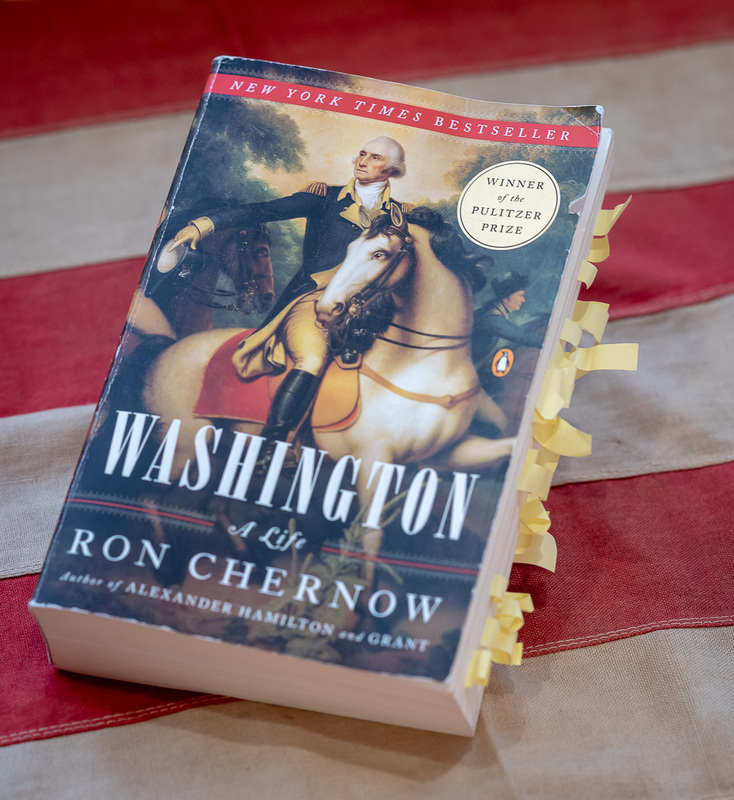 - Page 617: "Eager to augment presidential dignity, he bought more than tree hundred pieces of gilt-edged porcelain for dinner parties." In those days, porcelain was also known as "white gold" and a sign of affluence. 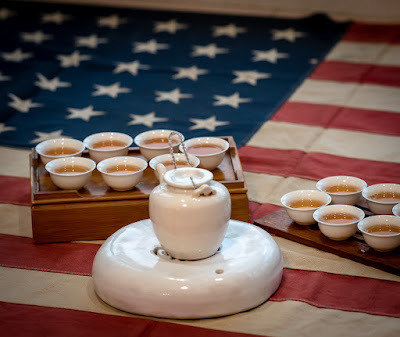 - Page 645: "She kept up her Friday-evening receptions, which came to be ridiculed as the Republican Court, even though Martha, the most unaffected of first ladies, frequently prepared tea and coffee for visitors herself." Even the modest wife of the hero of the USA was criticized by some! This is the lot of the powerful in a democracy. No matter what you do, you'll always have critics. 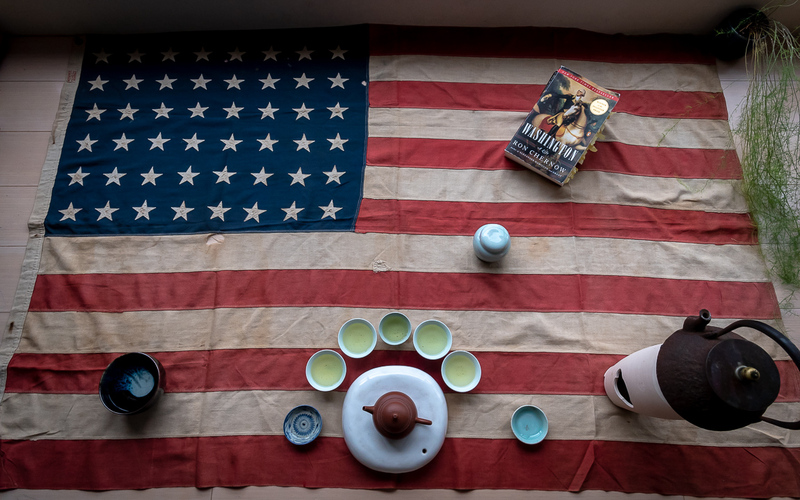 - Page 653: "In Georgetown, South Carolina, fifty ladies hosted him at a tea party." 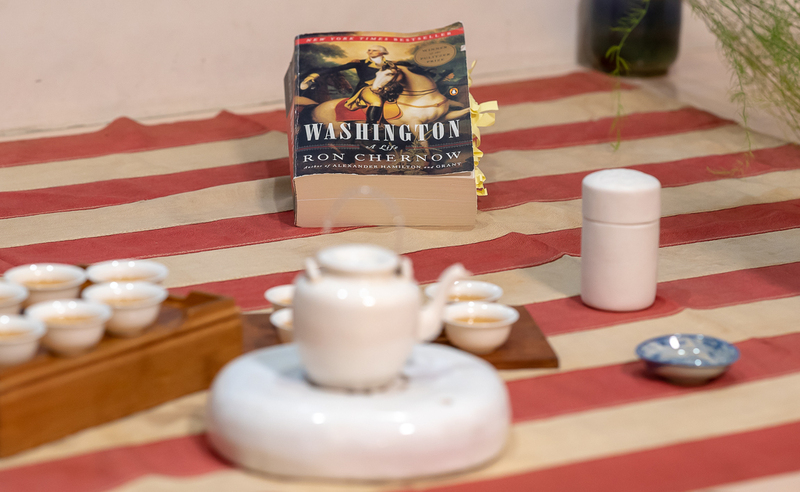 Washington didn't like to attend official ceremonies in all the towns he visited, but he did enjoy such tea parties with many ladies! He would sometimes skip town early to avoid the ceremonial goodbyes. On the other hand, he would enter towns on his white horse, even though he traveled in a coach between towns, because he knew this is the image the people wanted to see. - Page 684: "On December 13, 1792, Washington conversed with Jefferson about buying porcelain in Germany to dress the presidential table. 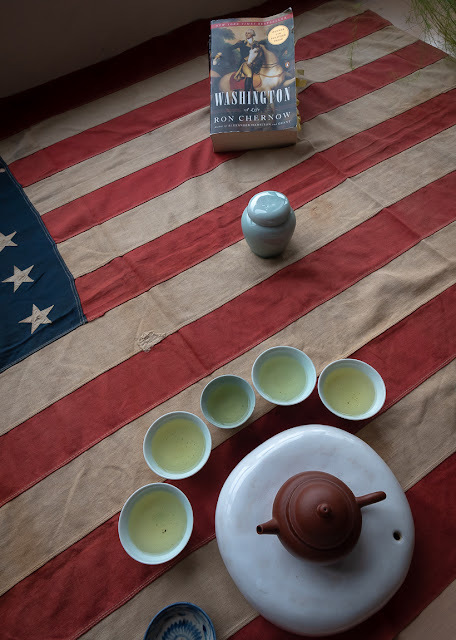 He had inquired whether Samuel Shaw, the US consul at Canton, could acquire china there, but Shaw told him that it would take at least 2 years to arrive." 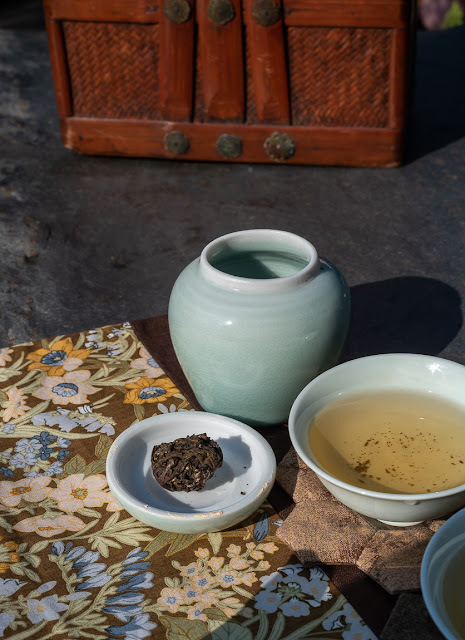 Thanks to modern progress, 2 weeks would be sufficient to order porcelain from China nowadays! - Page 790: "While in Philadelphia, Washington delighted in joining Elizabeth Willing Powel for a number of teas and breakfasts that he conspicuously failed to enter into his diaries." - Page 807: "He (Dr. Craik) also had Washington inhale steam from a teapot filled with vinegar and hot water. 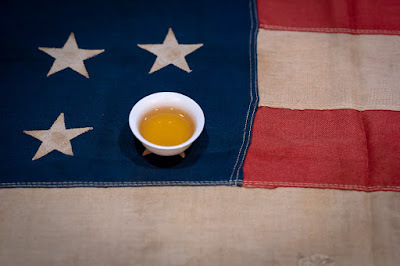 When Washington tilted back his head to gargle sage tea mixed with vinegar, he nearly suffocated." Neither sage tea nor teapot could save Washington who died on December 14, 1799 at age 67. For this second Chaxi, I used a high mountain Oolong from a more recent tea mountain, Qilai. I chose it for its vigor and energy, characteristics that have become those of the United States. My thanks Ron Chernow for this well documented biography. Looking at the past helps to understand the present. It's fascinating to see that human intrigues about power haven't changed that much since Washington!